Autism Spectrum Disorder (ASD) is a developmental disability characterised by difficulties in social interaction, impaired communication, restricted and repetitive interests and behaviors and sensory sensitivities. There is not one symptom of the developmental delays, it is a combination of factors. If you want specific information on Aspergers see it here. there’s early brain overgrowth, which means the brain grows faster than average. Watch the video for an explanation of the early signs of autism below. For more detailed information the RCN website provide an excellent evidence based information resource. Autism Assessment or Autism Screen. If you are concerned about your child there is an assessment that is carried out to identify whether your child has an ASD. In order to start the process for an assessment a General Practitioner (GP) needs to refer you to a Paediatrician/Psychiatrist. Medicare does provide some rebates for the assessment. We also have an autism screening program which provides additional insight into your child's condition, this screening is provided by our Psychologist and is often used to support a parents concerns before going to a GP or Paediatrician. No referral is required, see more information here. How quickly can yoU assess my child? Ladybug House offers a service that provides a multidisciplinary autism assessment in less than one month from initial appointment in the one location. We use the Autism Diagnostic Observation Schedule (ADOS -2), which is the gold standard for Autism Assessments. 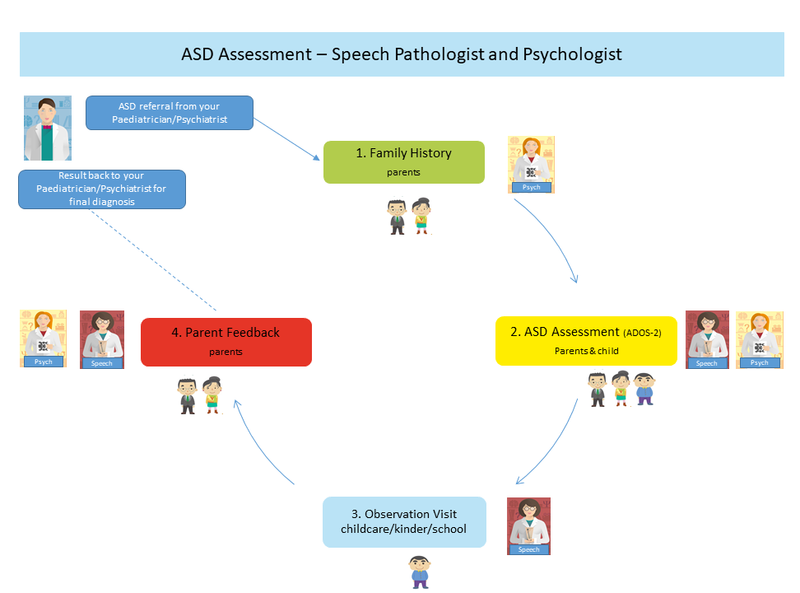 The team, consisting of a Psychologist and Speech Pathologist, will combine to complete an ASD assessment, over three visits to the one location (except for the observation visit in which the parent need not attend). All you need is a referral from your Paediatrician. • Reduced time and travel costs for only one location to visit over three appointments, no need for separate appointments with each practitioner which maybe up to 6 separate appointments. • Reduced duplication – you only need to provide your family history once. • Complete diagnosis in ~4-6 weeks. • Medicare and private health insurance claiming on site. • Ability to access early intervention services sooner (if required). What is the process for an autism assessment? Have a Paediatrician/Psychiatrist refer you for an Autism Assessment at Ladybug House for Speech Pathology and/or Psychology. Once you have the referral from your Paediatrician, call Ladybug House to organise a suitable time. If you have an existing referral for an assessment to another practice, you can still use it for Ladybug House, as long as it's for an Autism Assessment. This is important as the Paediatrician/Psychologist needs to activate specific item codes for Medicare so you can claim back some of the costs for at least 4 of the visits. There are a total of four appointments each running for approximately one hour. Children should be at least 18 months old and not older than 13 at the time of referral. If there needs to be a more general assessment about speech or developmental delay or behavioral problems, your GP should refer to a Paediatrician/Psychiatrist for a developmental and behavioral assessment. If you have any questions please call Gold Coast 07 5613 3000 or Melbourne: 03 9331 0720.